I've had this CJ5 since around 1982. Used it everyday for towing, stump pulling, etc. It just simply keeps on going. I'd love to have a Jeep JT Concept Pickup though. Would that last 30years? You bet! All the best to everyone. Larry's Comment: Thanks, Mike. 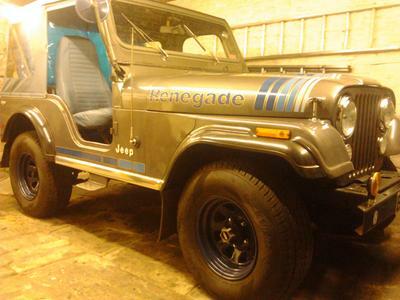 What year is your CJ5 Renegade? Did you buy it brand new, or used? What upgrades, additions have you made to your Jeep? Looks great! Oh, and by the way I wouldn't hold my breath for any new production Jeep pickups in the near future. We have been teased for a number of years since the last Jeep Comanche MJ pickups finished production in 1992. Vehicles (AEV) makes pickup conversion kits for Jeeps and is called the "Brute" kit. It is built on the owner's Jeep platform for various models. I swapped it for a CJ7 with someone I met at a petrol station.